Village with 345 inhabitants, the best-known resort of the region. It is situated at the foot of the Kőszeg hills, in picturesque environment. It was first mentioned in records in 1279. One of the most famous archaelogical sights of Central Europe can be found on St. Vid-hill above the village. 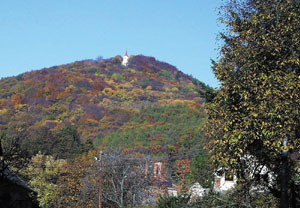 The church on the top of the hill can be seen from far away. Owing to the excellent climatic conditions, Velem has become a well-known resort and holiday centre with full infrastructure, clean air excellent for treating respiratory diseases. In the village there is a House of Crafts preserving the traditions of folk arts, in the territory of which the Hungarian Holy Crown was preserved between 29 December 1944 and 19 March 1945. Near the village you can find a monument water mill, which can still be operated. The starting point of the national blue tourist route is in Velem. The village is situated in the territory of Írottkő Nature-Park with a bicycle road crossing the village. One of the best known and most frequently visited events is the famous Chestnut feast in October.